To the Kikuyu, Bantu-speaking people who migrated to the foothills of Mount Kenya in the 1500s, the mountain is a sacred place and a central part of their creation myth. According to tribal legend, their god Ngai created Kirinyaga (Mount Kenya), “the mountain of brightness,” as an earthly dwelling place from which to survey his creation and bestow blessings and punishment upon his people. He granted Gikuyu, the founder of the Kikuyu tribe, a share of the rich land below the mountain and took him to the top to survey it. Ngai instructed Gikuyu that if he was ever in need, he should make a sacrifice and raise his hands toward Kirinyaga, and Ngai would come to his aid. He also pointed out a grove of fig trees, which Kikuyu today regard as sacred, and commanded him to establish a homestead there. When Gikuyu arrived at the spot, he found that Ngai had provided him with a wife, Mumbi. The couple produced nine daughters but no sons, so, following Ngai’s command, they made a sacrifice toward Kirinyaga and were granted nine young men to marry their daughters and perpetuate the Kikuyu tribes. The Kikuyu, an agricultural people closely tied to the land, continued to grow and thrive over the centuries, until the arrival of European colonists in the late 1800s. Kenya was claimed as a British protectorate in 1895, and the effect on Kikuyu culture was immense. White settlers began expropriating Kikuyu land for farming, displacing many and contributing to a breakup of the traditional tribal system. Christian missionaries arrived to convert the people, altering the traditional Kikuyu belief system. Perhaps because they were among the tribes who suffered the most under British rule, it was the Kikuyu who spearheaded the fight for Kenyan independence, which was ultimately achieved in 1963. After that time, many Kikuyu were able to reclaim land they had lost. Today more than 70 percent of Kikuyu claim to be Christian, but many have retained traditional beliefs as well. In times of need, such as drought, Kikuyu still turn toward Kirinyaga and perform ceremonies to Ngai. According to custom, Kikuyu homes are built with their doorways facing the mountain. Other communities who live around the mountain, the Meru and Embu tribes, also revere Mount Kenya. Rituals are carried out in the mountain’s sacred groves and holy men make pilgrimages up the mountain. For all communities, Mount Kenya remains a strong cultural symbol. In 1932, the government established the Mount Kenya Forest Reserve and in 1949, established a national park within its borders, encompassing an area of some 200 square miles, including the mountain and some of the surrounding forest. In 1978, UNESCO recognized the park as a Biosphere Reserve under the Man and Biosphere Program and in 1997, added the park and some of the adjacent forest to the World Heritage list as a World Natural Heritage Site. UNESCO recognizes its biodiversity and ecological value, and also its cultural value as a sacred place. Mount Kenya is vital to the livelihood of the local populations who revere it. They use the mountain’s forests to collect firewood, graze livestock and cultivate crops. Mount Kenya also plays a critical large-scale role: it serves as a water catchment reservoir for nearly one third of Kenya’s population and feeds the country’s largest river, which in turn supports hydro-electric plants that provide more than 50 percent of the country’s electricity. Unfortunately, its sustaining role is threatened by the destruction of its forests. This damage affects water catchment and soil stability, increasing the risk of flood and landslides during the rainy season and drought during the dry season. Longer-term impacts include destruction of biodiversity and disruption of wildlife habitat. A 1999 survey by the Kenya Wildlife Service found that illegal activities such as logging (both commercial and domestic), charcoal production, and marijuana cultivation were leading to massive destruction of Mount Kenya’s forests. Commercial logging, fueled by a demand for hardwood for furniture, continued despite a 1986 ban. And while firewood collection for domestic purposes was legal with a permit, those permits did not place limits on the amount of wood collected and were easy to forge. Poverty was driving many to seek income from marijuana cultivation and the production of charcoal from illegally felled trees. Charcoal is the only affordable fuel for many people in Kenya and demand is great. Physical surveys of the forests found hundreds of marijuana plantations, thousands of charcoal kilns, and thousands of acres of trees destroyed by logging. The Wildlife Service determined that the Forest Department was ill-equipped to manage and protect the Forest Reserve, and that penalties for illegal activities were weak compared to the potential gains. Legal farming activities were also having an adverse impact. The shamba system, a program that allows farmers to cultivate land as long as they plant trees—with the understanding that they will cease farming activities once the trees are grown—was unsuccessful because of poor supervision and enforcement. In 2000, because of the results of the Wildlife Service survey and resulting public outcry, the government changed the area’s status from Forest Reserve to National Reserve, which allowed for greater forest protection, and transferred management responsibility from the Forest Department to the Kenya Wildlife Service. The Wildlife Service immediately began successful operations to end illegal logging activities and marijuana cultivation. In 2002, the Wildlife Service, along with the U.N. Environment Program and other groups, assessed the progress that had been made since the 1999 report and found great improvement, including a 90 percent decrease in logging in indigenous forests, tremendous reduction in marijuana cultivation, and renewal of the shamba system. That success has spurred greater international funding and support, which is helping to develop a comprehensive management plan for the Mount Kenya ecosystem and numerous community-based projects. There appears to be consensus among experts, government agencies and NGOs that involving the local communities — helping them reduce poverty, giving them a voice in decision-making and supporting their cultural identity — is the key to ensuring Mount Kenya’s preservation. Community Management of Protected Areas Conservation (COMPACT) aims to engage communities living around Mount Kenya as essential players in government and non-governmental conservation and protection efforts. Through one COMPACT project, community members are equipped and trained to keep bees in or near forest areas; beekeepers then monitor for illegal activities in the areas around their hives, and through resulting honey production they are able to generate income. Other projects involve tree planting, promoting energy-efficient stoves and reducing garbage dumping. The Kenya Wildlife Service has adopted a Forest Conservation Program that integrates sustainable forest management and community participation. The Wildlife Service is also seeking to develop forest-based ecotourism, which could serve as another alternative means of generating income for the local population. In general, tourism potential at Mount Kenya remains relatively untapped, although the site appeals especially to mountain climbers looking for an alternative to Mount Kilimanjaro in neighboring Tanzania. However, the National Park has education and monitoring policies in place to minimize the environmental impact of visitors as tourism begins to grow. 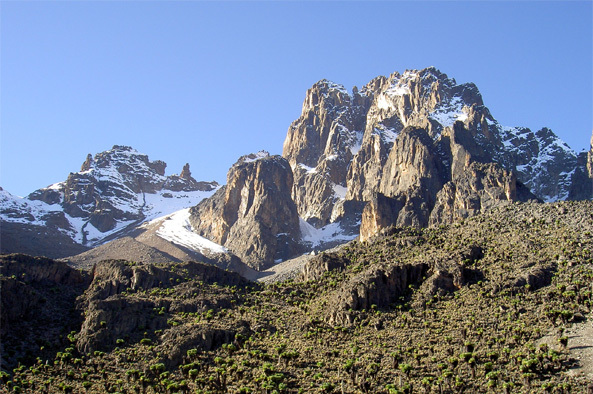 Another challenge Mount Kenya faces is the potential loss of its glaciers. In the late 1800s there were 18 identified glaciers; today seven of those are completely gone. In recent decades the rate of recession has accelerated, and it is estimated that in about 20 years there may be no permanent ice left on the mountain. The disappearance of Mount Kenya’s glaciers will affect the water supply and potential income from tourism, and will no doubt mar this hallmark of the Kenyan landscape that serves as a source of inspiration for many. In neighboring Tanzania, Mount Kilimanjaro is suffering a similar fate. While experts have for many years believed that the glacier loss is due to global warming, some now believe that regional environmental changes, such as deforestation, claim a greater impact. There are no currently active international campaigns for Mount Kenya, but check back here periodically for updates. “Community Management of Protected Areas Conservation (COMPACT).” GEF Small Grants Programme. Kenyatta, Jomo. Facing Mount Kenya. Vintage Books, 1965. “Mount Kenya National Park.” Kenya Wildlife Service. United Nations Educational, Scientific and Cultural Organization.”Mount Kenya National Park/Natural Forest.” UNESCO World Heritage Centre. Woodley, Bongo. “Mount Kenya National Park: Challenges in Protection and Management.” World Heritage Review, November 6, 2003.